Senado Square (Largo do Senado) is a public square in Macau. 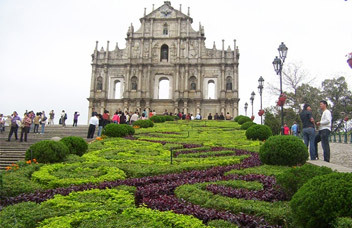 It is located in the central area of the Macau Peninsula. Covering an area of 3,700 square meters (4,425 square yards), this is one of the four largest squares in Macau; the others being Praça do Centro Cultural, Praça do Lago Sai Van and Praça do Tap Seac. 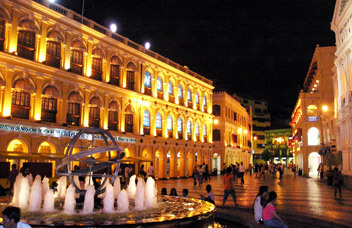 In 2005 it was inscribed on UNESCO's World Heritage List as it forms part of the Historic Centre of Macau. The square is so named as since Ming Dynasty (1368-1644) it has been in front of the Leal Senado Building. During the era of Portuguese control this is where the local authorities used to review the troops on their inaugurations. In 1940, there was a statue of a Portuguese soldier named Mesquita in its centre. He was responsible for the deaths of many Chinese soldiers during the hostilities with the Qing Dynasty (1644-1911). Understandably, the statue has been destroyed by Chinese people and replaced by a fountain; this is why the square is also called "the Fountain". In the early 1990s, the authority hired some Portuguese experts to pave the square with a wave-patterned mosaic of colored stones. From then on this area has become a popular place for cultural activities in Macau. The buildings around the Senado Square have a long history and have many western features, so they have been well protected by the authority and no one is allowed to alter the facades of these buildings. There are shopping centers and traditional Chinese restaurants around the square. Fashion clothes, famous snacks and the scenic environment make it a famous attraction. Firework displays, lion and dragon dances are usually held on special days such as the Chinese Spring Festival and Christmas. One can go and enjoy those activities. Around the Square, there are other attractions. To the east of the square, there lies the Macau Cathedral. At the end of the paved road, there is the St. Domingo's Church. On the third floor of the church there is a museum of paintings, sculptures and liturgical ornaments that illustrate the history of the Roman Catholic Church in Asia. Walk to north of the church and you will arrive at the Ruínas de S. Paulo (Ruins of St. Paul's). This is the most famous landmark in Macau. Right at the east of the Ruínas de S. Paulo is the Museum de Macau (Macau Museum), in which historical relics of Macau are exhibited. The Lou Kau Mansion is located to the northeast of the square. Walk to the southeast along the Av. De Almeida Ribeiro (San Ma Lo) from the square, and you will find the Casino Lisboa, a famous casino in Macau.